If you put this CD on expecting to hear half of Brooks and Dunn, you probably won’t get what you were looking for but in a pleasantly shocking way. 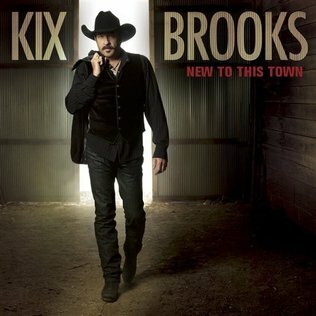 Kix Brooks held strong for many years as half of Brooks and Dun and we sure do miss that duo but his extraordinary voice and song writing talent carry on. After listening to his first solo album, which could be called New to Kix Brooks, it became obvious that we are completely unfamiliar of this man. Even though, we’ve witnessed his work for so many years. This is – of sorts – a collection of rock songs with a country kick. Not exactly southern rock but you can hear the rock and roll influence. It would be appropriate to call them more of a bluesy rock with a thick, deep southern drawl. All in which create an extraordinary combination. The kind of combination that draws you in, holds you, and won’t let go. The title track is an enjoyable romp through a southern town that he wishes he was visiting for the very first time, everything old is new again. As you are transported to this little town, the song ends and then he starts singing Moonshine Road and you are blown away. This is a new performer we have not heard before. He sings this bluesy song with his southern style and listening to it you are “riding shotgun with a bootleggers’ son”….. You can picture every image he is painting with that deep southern baritone. In Tattoo he talks rather than sings and again the imagery is so vivid you are right there with him. There are very few ballads on this CD but Brooks is not primarily a ballad singer although he can be if he wants to be as in She Knew I was a Cowboy. He sings songs about life and love as a lot of country singers do but he goes far beyond that country standard. In Closing Time at Home, he sings very cleverly about hoping to get lucky as they leave the bar yet the bar is his kitchen at home where “there is no clean up, no bar stools to put away” This is a toe tapper you will want to sing along with. Again as in Moonshine Road, his imagery is so vivid you are transported to where he is, be it a back country road, small town, railroad tracks or his kitchen. Brooks can be a country crooner, ballad singer if he wants to be, he has the talent but he has chosen this bluesy rock with a southern twist, country feel to it style instead and that suits him as well as us just fine .It fits so well that we can’t wait until his next CD.